Finally, cigarette packets in the UK will look like this once the current stock has been sold! Brands will no longer draw in users. Only nicotine and addiction. 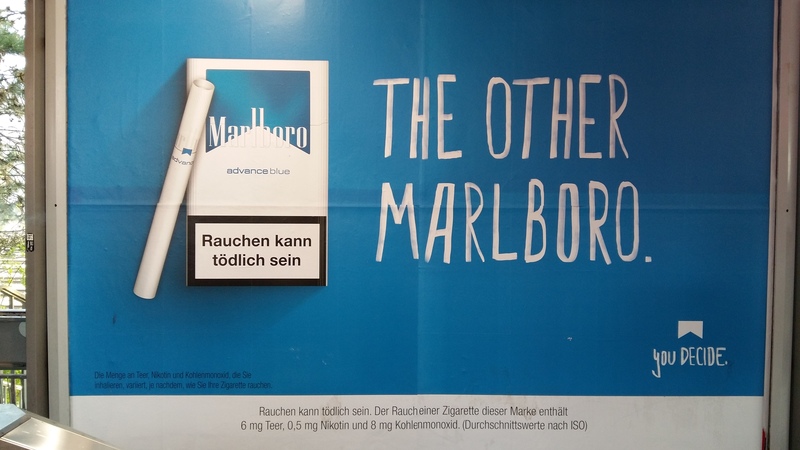 However, readers of this blog know only too well that in Germany, cigarette advertising continues for inexplicable reasons. But it is about to change considerably. The 65 per cent rule comes from the European Commission and states that 65 per cent of any cigarette packet must be covered with warnings about the lethality of the contents in all member states. So, take Marlboro, with it’s You Decide campaign (right). The campaign posters and the packet is all about the brand. 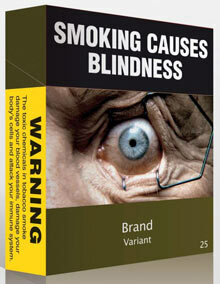 Currently, about one-third of the packet contains the warning Rauchen kann tödlich sein (smoking can be deadly). So, that warning will have to be doubled on both sides. How much room left for the brand? We’ll see how the advertising responds to this challenge. At the moment, there are no new posters on railway stations or on the side of the roads to evaluate!